This photo is from the 2012 season. 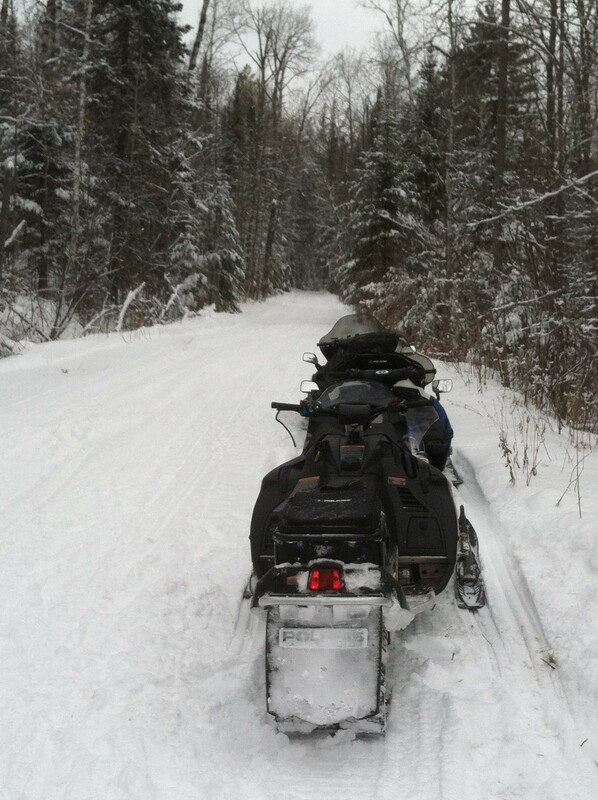 We are excited to hit the snowmobile trails with friends again this season! Yesterday was the first day in many that we have crawled our way to temps above zero. In fact, the 7 degrees farenheit outside felt like a heat wave! In spite of the unseasonably cold weather hearty souls have been hard at work getting Itasca County x-ski trails and snowmobile trails ready for action. This is the first time in our 15 years at Wildwood that we can remember having groomed trails this early in December. From trail reports we’ve heard most of the x-ski trails have been groomed at least once. And the Bushwacker Snowmobile Trail that runs just south of the resort has also been groomed. We had about 12″ of snow fall right before the cold snap so that should provide a good base on area trails. Area cross-country ski trail reports and snowmobile trail reports can be found on the Trail Reports page of the Visit Grand Rapids website. Ice conditions are area lakes haven’t faired as well with the heavy snowfall. While most reported 6″ or so of ice before the snow that wasn’t enough ice to hold the all the snow that fell. Most lakes are very slushy right now under the crusty layer of snow. In fact, one of our neighborhood teens found that out the hard way last week when he headed out onto Bass Lake on his sled. Conditions were very slushy resulting in a stalled snowmobile and one (very) angry dad. For the time being our opinion is that Bass Lake is too slushy to navigate on snowmobile or 4-wheeler but hopefully the cold temps will work to firm things up by the first of January. We are happily anticipating the upcoming holiday season and look forward to celebrating Christmas with my side of the family at Wildwood this year. And after that?! We look forward to jumping on our sleds and hitting the trails. Winter is going to be hanging around for awhile – we might as well get out and enjoy it!